Christopher Henry is a musician/singer, composer/arranger, producer/engineer, teacher/learner, currently residing in Frederick County, VA, near Winchester. 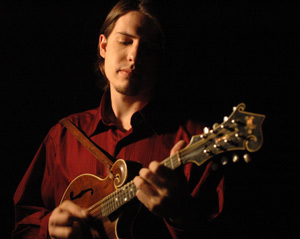 Chris teaches our Bill Monroe-Style Mandolin DVD, and appears on numerous others playing rhythm guitar. Around the age of ten he started learning to play and began performing with his parents, Red and Murphy Henry. He started teaching a few years later. Chris composed his first tunes almost as soon as he learned to play, with his early melodies "Leatherjackets" and "___" appearing on the two albums the family band recorded. Chris has performed in over a dozen ensembles at venues from small house concerts to large folk festivals and The Grand Old Opry. Following a move to Nashville he played with such bands as David Peterson and 1946, Audie Blaylock and Redline, the Lynn Morris Band, and Shawn Camp. For three years he and his sister had a band called Casey and Chris and the Two-Stringers, which released one CD, Get Along Girl. He currently appears on selected dates with Danny Barnes. Chris's solo album is titled Monroe Approved. Released in 2006, it features many of Chris's wonderful original tunes, including the much requested "Listen to the Lonesome Train" (a.k.a. "Boxcar Door"). Joining Chris are some of the top musicians in bluegrass today: Ronnie McCoury, Jason Carter, Mike Bub, Alan O'Bryant, Charlie Cushman, and Casey and Red Henry. In the last ten years Chris has produced over ten albums in genres from bluegrass to rock, folk, and even rap/hip-hop. He has taught students from the ages of seven to seventy, and has enjoyed presenting many educational workshops. Chris currently teaches private lessons on a regular or drop-in basis, produces and records albums, and performs on the mandolin and guitar. He can be reached at 615-495-6835 or cbhenry (at) visuallink.com.